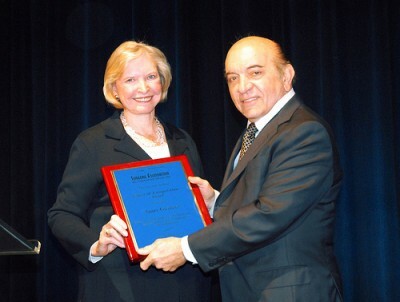 Pioneering race car driver Janet Guthrie – the first woman to compete at the Indianapolis 500 and in NASCAR – received the second annual “Spirit Of Competition” Award from the Simeone Foundation Automotive Museum in Philadelphia, Pennsylvania. Presenting the award was David Donohue, winner of the 2009 Daytona 24 Hours, and son of the late Mark Donohue. Guthrie joins inaugural honoree Mario Andretti in being a “Spirit of Competition” Award recipient. Before becoming the first woman ever to compete in the Indianapolis 500 and the Daytona 500, Janet Guthrie was a pilot, flight instructor, and an aerospace engineer – a modern day Amelia Earhart. In 1977, she became the first woman to qualify for and compete in the Indianapolis 500. That same year she was also the first woman and Top Rookie at the Daytona 500. She finished ninth in the Indianapolis 500 in 1978. Janet Guthrie was one of the first athletes named to the Women’s Sports Hall of Fame, and her driver’s suit and helmet are on display at the Smithsonian Institution. After Guthrie addressed the group, Dr. Simeone announced the newest addition to the Museum collection: a 1963 Corvette Grand Sport. First he unveiled the duplicate, replica body created so the chassis could be vintage raced without damaging the original body. Then he gave the signal for Curator Kevin Kelly to drive the original car in from the shop to the front of the stage as all 125 attendees covered their ears to protect them from the noise of the unmuffled 427 cubic-inch Chevrolet V-8. The Simeone Foundation Automotive Museum is a 501(c)3 non-profit corporation and encompasses many of the most significant racing sports cars ever built. The Museum, which has been open to the public since June 2008, differs from most other automotive collections in that the cars are used to tell a story: that competition and racing improves the breed. For more information, call 215-365- 7233 or visit www.simeonemuseum.org. The Museum is open Tuesday through Friday from 10 a.m. to 6 p.m., Saturday and Sunday from 10 a.m. to 4 p.m. Admission is $12 adults, $10 seniors, $8 for students. Children under 8 are admitted free.